Medial collateral ligament (MCL) injuries of the knee are very common sports-related injuries. The MCL is the most commonly injured knee ligament. Injuries to the MCL occur in almost all sports and in all age groups. The medial aspect of the knee has been divided into 3 distinct layers based on cadaver dissection. The first layer is the deep fascia, which consists of the sartorius fascia anteriorly and a thin fascial layer posteriorly. The thin posterior fascia covers the popliteal fossa and the heads of the gastrocnemius muscle. 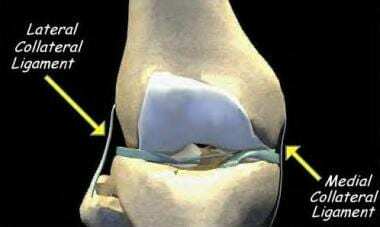 The second layer includes the superficial MCL, also known as the tibial collateral ligament. This ligament attaches proximally to the medial femoral epicondyle and to the tibia distally, approximately 4-5 cm distal to the joint line. The parapatellar retinaculum and patellofemoral ligament are within this layer. The third layer is the knee joint capsule, which attaches proximally and distally at the articular margins. The capsule is divided into thirds from anterior to posterior. The anterior third of the capsule is the thinnest portion. It is attached to the anterior horn of the medial meniscus and is reinforced by the medial retinaculum. The middle third of the capsule consists of the deep medial collateral ligament. It is firmly attached to the mid body of the medial meniscus. Proximal to the meniscal attachment, it is termed the meniscofemoral ligament. Distal to its meniscal attachment, it is termed the meniscotibial ligament. The posterior third of the capsule includes the posterior oblique ligament (POL) and the oblique popliteal ligament. The POL has 3 arms, the superficial, tibial, and capsular. The superficial MCL has been shown through serial cutting studies to provide the primary restraint to valgus loads at all degrees of flexion. It is also an important restraint to anterior tibial translation when the anterior cruciate ligament is injured. The superficial MCL acts as a primary restraint to external rotation of the tibia. Roach CJ, Haley CA, Cameron KL, Pallis M, Svoboda SJ, Owens BD. The epidemiology of medial collateral ligament sprains in young athletes. Am J Sports Med. 2014 May. 42(5):1103-9. [Medline]. Chahal J, Al-Taki M, Pearce D, et al. Injury patterns to the posteromedial corner of the knee in high-grade multiligament knee injuries: a MRI study. Knee Surg Sports Traumatol Arthrosc. 2009 Dec 15. [Medline]. Griffith CJ, LaPrade RF, Johansen S, et al. Medial knee injury: part 1, static function of the individual components of the main medial knee structures. Am J Sports Med. 2009 Sep. 37(9):1762-70. [Medline]. Wijdicks CA, Griffith CJ, LaPrade RF, et al. Medial knee injury: part 2, load sharing between the posterior oblique ligament and superficial medial collateral ligament. Am J Sports Med. 2009 Sep. 37(9):1771-6. [Medline]. Laprade RF, Bernhardson AS, Griffith CJ, et al. Correlation of valgus stress radiographs with medial knee ligament injuries: an in vitro biomechanical study. Am J Sports Med. 2009 Dec 4. [Medline]. Laprade RF, Bernhardson AS, Griffith CJ, Macalena JA, Wijdicks CA. Correlation of valgus stress radiographs with medial knee ligament injuries: an in vitro biomechanical study. Am J Sports Med. 2010 Feb. 38(2):330-8. [Medline]. Dale KM, Bailey JR, Moorman CT 3rd. Surgical Management and Treatment of the Anterior Cruciate Ligament/Medial Collateral Ligament Injured Knee. Clin Sports Med. 2017 Jan. 36 (1):87-103. [Medline]. Lind M, Jakobsen BW, Lund B, et al. Anatomical reconstruction of the medial collateral ligament and posteromedial corner of the knee in patients with chronic medial collateral ligament instability. Am J Sports Med. 2009 Jun. 37(6):1116-22. [Medline]. Pandey V, Khanna V, Madi S, Tripathi A, Acharya K. Clinical outcome of primary medial collateral ligament-posteromedial corner repair with or without staged anterior cruciate ligament reconstruction. Injury. 2017 Jun. 48 (6):1236-1242. [Medline]. Albright JP, Powell JW, Smith W, et al. Medial collateral ligament knee sprains in college football. Effectiveness of preventive braces. Am J Sports Med. 1994 Jan-Feb. 22(1):12-8. [Medline]. Fanelli GC, Edson CJ, Orcutt DR, et al. Treatment of combined anterior cruciate-posterior cruciate ligament-medial-lateral side knee injuries. J Knee Surg. 2005 Jul. 18(3):240-8. [Medline]. Halinen J, Lindahl J, Hirvensalo E, Santavirta S. Operative and Nonoperative Treatments of Medial Collateral Ligament Rupture With Early Anterior Cruciate Ligament Reconstruction: A Prospective Randomized Study. Am J Sports Med. 2006 Feb 1. Lundberg M, Messner K. Long-term prognosis of isolated partial medial collateral ligament ruptures. A ten-year clinical and radiographic evaluation of a prospectively observed group of patients. Am J Sports Med. Mar-Apr 1996. 24(2):160-3. [Medline]. Lundberg M, Messner K. Ten-year prognosis of isolated and combined medial collateral ligament ruptures. A matched comparison in 40 patients using clinical and radiographic evaluations. Am J Sports Med. 1997 Jan-Feb. 25(1):2-6. [Medline]. Reider B. Medial collateral ligament injuries in athletes. Sports Med. 1996 Feb. 21(2):147-56. [Medline]. Reider B, Sathy MR, Talkington J, et al. Treatment of isolated medial collateral ligament injuries in athletes with early functional rehabilitation. A five-year follow-up study. Am J Sports Med. 1994 Jul-Aug. 22(4):470-7. [Medline]. Warren LF, Marshall JL. The supporting structures and layers on the medial side of the knee: an anatomical analysis. J Bone Joint Surg Am. 1979 Jan. 61(1):56-62. [Medline].